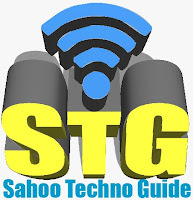 Whenever we copy file from one directory to another directory on that case Window show the progress and file detail, time remaining, no of file remains to copy and many more which were copy by user. 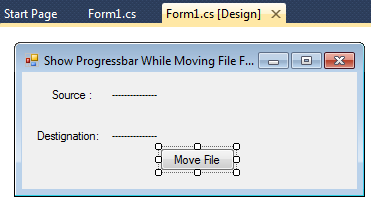 So this article will show you Show Progressbar While Moving Folder File From One Directory To Other Using C#.Net In Windows Application. Some of my previous articles are as follows: How to Create Column Chart in Windows Application Using C#.Net, Windows Application - Excel Sheet Name in C#.Net, Bind And Display Image in a DatagridView Using C#.Net in Windows Application, WaterMark TextBox In Windows Applications Using C# and VB.Net, Pass Value From One Form to Another Form in Windows Application C#.Net,VB.Net, How to Minimize an Application to the Taskbar Tray in C#.Net | System Tray Application C#, How to get the selected date of a MonthCalendar control in C#. For this article first we will create a new windows application in this window we will add button control and label control. After adding all the controls your form will look as shown below. Now generate the button click event. Add the code to copy file from one directory to another directory. But before that we need to add library reference for copying the file. For that first we will right click on References folder. Now a dialog box will open in this on .net tab select “Microsoft.VisualBasic”, select this dll and click on ok button. After adding this reference add the below code. // Destination for copied files. In above code check the Microsoft.VisualBasic.FileIO is used for FileSystem.CopyDirectory. 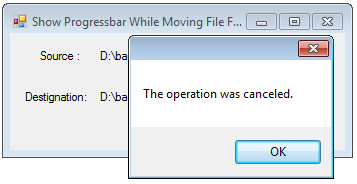 Now click on "Move File", you will get the dialogbox as shown below. Now if you click on cancel button you will get the cancel message, Basically it's an exception which i an showing in message box. 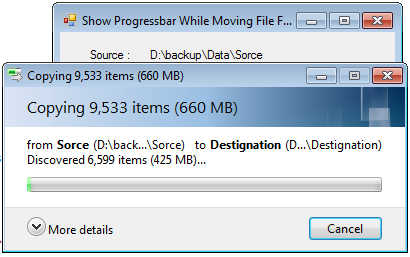 On other hand if file moves successfully dialog box will disappear.